Invited to a family potluck Thanksgiving dinner this year, we were in charge of bringing the vegetable dish. 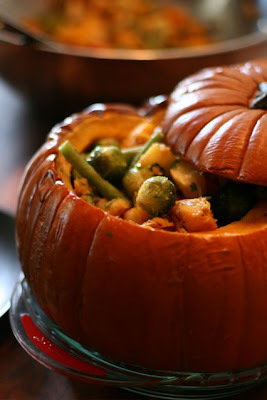 When I saw a stuffed pumpkin recipe in this month's Martha Stewart's Living Magazine I had to try it. The only problem was that the stew in the recipe was a chicken stew. And that seemed a bit redundant for a turkey dinner. That's when I decided to modify it to be veggie only. For the most part the following recipe is Martha's, minus the chicken and potatoes and plus more veggies. We preheated the oven to 375° while we gutted the pumpkin and oiled it inside and out, including the lid with 3 tablespoons olive oil. We placed the pumpkin and top on a parchment-lined baking sheet, and roasted until tender but still holding its shape, 50 – 60 minutes. While it was baking, we chopped and cubed and sliced our little hearts out. 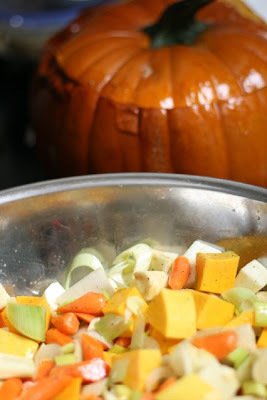 We tossed the leeks, carrots, turnips, parsnips, squash, and celery root in a large bowl with a 1/2 cup of oil and s + p. Next we spread them in a single layer on a rimmed baking sheet, and roasted them until golden brown, about 40 minutes. 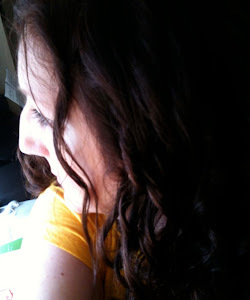 Meanwhile we prepared an ice-water bath and brought a large pot of salted water to a boil. We added the brussels sprouts to the boiling water and cooked them until they became bright green and crisp-tender, about 2 – 2 1/2 minutes. With a slotted spoon, we transfered them into the ice bath. 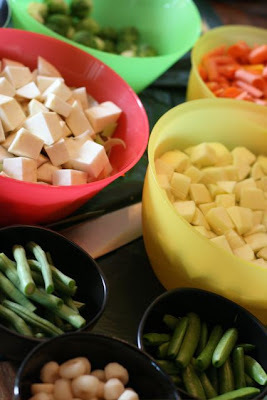 We repeated the above with the green beans and then the snap peas. 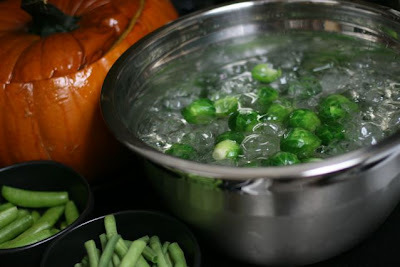 Finally, we scooped out the bulk of the ice and rescued the bright green veg from their frigid bath. We heated the butter in a large pan over medium heat. 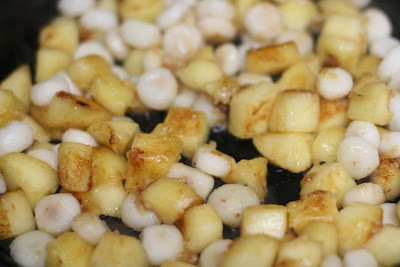 We added the apples, and cooked them, stirring occasionally, until golden brown and softened, about 10 minutes. We stirred in chestnuts and removed from heat. Once the roasted veg came out of the oven, we added the brussels sprouts, green beans, snap peas, apple mixture, and garlic, and tossed. We threw it back in the oven for 10 more minutes. 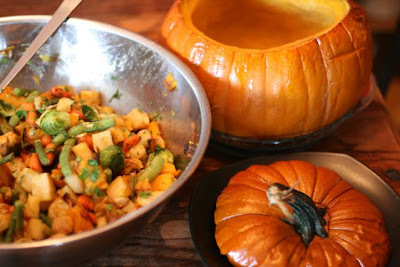 Before finally filling the pumpkin add parsley and stock to the veg mixture. 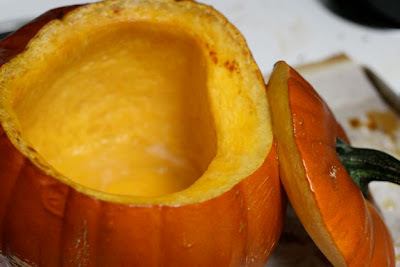 Once pumpkin is stuffed, replace lid and bake to heat through, about 15 minutes. Exactly what I was looking for! I'm not a Martha Stewart supporter in any way, but since you altered this recipe, I'm totally fine with trying it! !